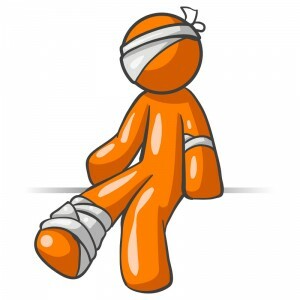 When one seriously devotes oneself to the practice of martial arts injuries are simply an inevitability. It isn’t if they will occur but rather when and what type they will be. They must be considered an occupational hazard and in a sense, a rite of passage. You know someone is truly serious about the martial arts and considers it more than a minor hobby if they can endure a serious injury, go through surgery and months of physical rehabilitation and still return to train again. Nobody wants to get injured, but if you train hard enough and long enough the odds are against you never having anything go wrong. As they would say in Buddhism, all things are impermanent and all things break down, especially the body. However, if one mentally prepares for this ahead of time it will greatly enhance their ability to make the best of these set backs. As the old saying goes “if you’ve got lemons, make lemonade”. The practice of the martial arts makes people both physically and psychologically stronger, and that goes for injuries in addition to victories and defeats in the ring or on the mat. In this article I will discuss my own personal experiences with injuries in the martial arts and how I believe they have made me a better martial artist while also using examples of other martial artists who have physical limitations but have still thrived nevertheless. When I first began training in the art of Brazilian Jiu-Jitsu at age 16 I was not of the mindset that I would ever get injured. It was not until I was in my mid 20s and began training with serious Pro MMA fighters and grapplers and heard about their injuries that I realized I would most likely have an injury at some point. My first serious injury occurred when I was twenty-eight years old. While practicing Judo throws with my instructor I attempted to base out with my right leg in order to defend against the takedown. I had not yet learned Judo break falls, which I have since learned, and did not at the time realize the mistake I was making. My knee twisted sideways and popped, and as I went down in pain I knew that something serious had just occurred. Soon afterwards an MRI confirmed that I had in fact torn my right anterior cruciate ligament, which is one of, if not the single most common injury throughout all sports including martial arts. Before this first knee surgery I had quite a bit of trepidation. I was not sure how I would recover and whether or not I would be able to go back to Brazilian Jiu-Jitsu feeling the same as I had before. I had never gone through physical therapy and was not looking forward to all the pain I would have to endure. I had heard that other people who had torn their ACLs had not been able to recover fully and had not gone back to training in the martial arts. However, I also knew that my instructor, Brian McLaughlin of Precision MMA in Poughkeepsie, had also torn his ACL and had returned to become better than ever before and become a well-known MMA champion in the Hudson Valley area and throughout the Northeast United States. This gave me hope that perhaps I too could come back in one piece from my surgery. After I awoke from my knee scope my first few weeks of rehab were a rude awakening. One of the first exercises I remember having to practice was simply to sit up-right in a chair with my back flat against the backboard and to try to lift the bent injured knee to my chest. To my dismay, on my first try not only could I not lift my knee to my chest, I barely even had the strength to lift my foot more than an inch off the floor. Quite frankly, it was shocking. A movement that I’d been able to do since I was a toddler was completely impossible for me, and took weeks of daily practice to be able to perform again, and with every attempt I would experience quite a bit of pain. This was just one of so many normal movements I could not perform. I could not walk without crutches and I could not even stand up fully without leaning on something. After about a month of rigorous physical therapy however, I found that I could very carefully walk a few steps without crutches, and when I achieved it, it was a major breakthrough. After about 2 months of rehab I was able to balance on the injured leg itself for up to 40 seconds, and only someone who has been through a surgery like this can understand how that can feel like a major accomplishment. Soon I could walk without crutches, then walking progressed to jogging and finally jogging progressed to running. Before I knew it I was back on the mat doing Brazilian Jiu-Jitsu, Muay Thai, wrestling and boxing just like before. However, this was not the last injury I would have to endure. My rites of passage were not over yet. At age 31 I was doing some no-gi grappling in a Brazilian Jiu-Jitsu class with a newer student and when I tried to take his back he attempted some sort of escape which left me off balance. I fell to my left side and my left leg twisted underneath me and popped loudly, just like the right one had two and half years earlier. The second that I felt my knee buckle I immediately knew that I had injured my left knee in exactly the same way as the right, and an MRI confirmed that this time not only had I torn my left ACL but I had also partially torn my MCL. When I went through rehab this time my mind felt pulled in two directions in terms my thinking about my recovery. On the one hand, I had been through this before and so I was overall much more optimistic than the first time. I knew what knee rehabilitation was all about, I wasn’t entering the unknown and I knew very well that I was capable of fully recovering and would not be surprised by any of the difficulties I would encounter. However, I also knew that this time upon returning I would have two surgically repaired knees. I was not sure how this would impact me and whether or not I might have been overly relying on the left one last time. Yet my experience with the first injury proved invaluable as I recovered in record time from this injury with much less trouble than the first. In fact, I believe that now both of my knees and legs in general are physically stronger than they ever were before due to all the rehab I went through. Before I even returned to BJJ after the second knee surgery I was leg pressing 450lbs with only my left “injured” leg, and experienced quite an ego boost when I would see other people attempt to press that same amount of weight with both of their uninjured legs, and fail. It was at this point that I realized for the first time in my life that I was capable of running a sub seven-minute mile, and that I could keep up a pace of 10 miles per hour on a treadmill for two minutes straight despite being slightly overweight. All the rehab had improved my leg strength beyond what it had ever been before. When I returned to Brazilian Jiu-Jitsu and martial arts at Precision MMA this time I noticed a number of differences begin to evolve in my game. First of all, because my left knee was sensitive to base out on from where the incision had been made I found myself basing out on my left foot while passing my opponent’s guard and improved at this sort of passing, and I also began to improve some of my standing guard passes as well. 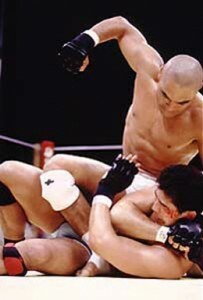 Once I had passed my opponent’s guard I found myself more likely to place my left knee on the opponent’s belly and became much better at holding this position as a result of the knee being too sensitive to put directly down on the mat, and I also started working more on my kasagatomi position rather than normal side control where the knee would be driving into the ground. While doing takedowns I stressed those moves which would not involve my left knee touching the mat to avoid the discomfort, and in some cases I worked on takedowns where neither knee would touch the mat and became better at these sorts of takedowns overall. It is also important to note that the practice of not allowing your knees to touch the mat for long periods of time while doing takedowns or while ground grappling is an important skill to learn for street self defense since even an uninjured knee will hurt quite a bit if grinding against hard pavement. One other major area of my game that I improved as a result of my left knee having recently been operated on was that I started to move away from doing so many leg locks in my regular Jiu-Jitsu training. Leg locks have always been one of my favorite attacks in grappling but one problem with them is that when going for a leg lock one often leaves oneself vulnerable to the leg locks of the opponent. Despite the fact that according to my orthopedic surgeon a repaired ACL with patella tendon graft is roughly 27% stronger than a normal ACL, I was not about to put this theory to the test by giving my opponents more chances to crank on my knees. And so instead of working on leg locks, which I knew I was already proficient at, I started working on all the weaker areas of my game. Among other attacks, I started focusing greatly on brabo chokes, lat chokes, bread cutter chokes, wrap around chokes, carni’s (a shoulder lock from rubber guard named by Eddie Bravo), and other submissions which would not jeopardize my knees. I also transitioned some of my favorite leg lock attacks which I used to use from bottom guard and bottom half guard into sweeps. I would use the same entries for the leg locks as I would previously, but instead of finishing with a leg lock as I would before I learned to release the submission and sit up on top of my opponent to achieve the sweep. In turn, this resulted in my ending up on top in regular rolling more often than before, and subsequently my entire top game improved, including guard passing, half guard passing, maintaining mount, side mount and back mount and all of the submissions I’d been working on from top positions. Nor did I feel that my bottom guard game was any weaker than before, and despite my knees sometimes being sore after class and needing a little bit of icing, I saw that I could do every movement I had previously done in Jiu-Jitsu just as easily. Not only this, but my kicks and knees in muay thai felt as if they had more impact, my footwork felt faster and I actually think that my takedown defense in wrestling improved due to not only increased leg strength but increased core strength due to getting used to balancing on one leg as a part of physical therapy. And if we are to discuss tests of leg strength which fall outside the range of martial arts, just the other day I ran the fastest mile I’ve done in my life, at 6:28, running at 10 miles per hour for 3 minutes straight and just under that for the remainder. So now when I hear people say that “few people fully recover from ACL surgeries and return to martial arts” (and believe me, I have heard this quote frequently and said with one hundred percent sincerity), I can only shake my head at the limits that the human mind imposes on the body. I believe that few of the people who have quit martial arts as a result of ACL injuries have done it simply because of the injury itself but more because their minds were conditioned to believe they could not overcome it. Now that I have worked my way back through two ACL surgeries I believe even more in my ability to overcome other future obstacles and I fully realize the potential of injuries to make a martial artist better, both externally as well as internally. Indeed, these past set backs should prepare me quite well for tomorrow morning, when I will undergo a minor surgery on my wrist to repair a partially torn ligament. I don’t yet know whether or not a subsequent surgery will be necessary after this one, and if it is I may be out from training for as much as 6 months and require titanium pins to hold the ligament in place, much like the ones I already have in my knees. Either way I certainly have at least a couple months of physical therapy to look forward to and yet I feel relatively un phased because I have been through it all before and worse with my ACL surgeries and the rehab they entailed. I am sure that even before it fully heals I will learn ways both in life and in the martial arts to work around this injury, and in fact, I already have. The words that I am typing right now are being done with only my left hand which should serve me well in achieving more dexterity in those digits and my Muay Thai training as of late has consisted almost entirely of kicks, knees and elbows which I feel has made me even better at those techniques. Now instead of dreading my return to martial arts I wonder what other new ways I can improve my arsenal through this injury, and if more are to come after that, as they quite likely will, I will do my best to count them as blessings instead of curses, and always return to the mat afterwards to see what new tricks I can develop out of these setbacks. Though not injuries per say, there are a few notable martial artists who have become very accomplished not in spite of, but rather due to what most would call physical “handicaps” or “shortcomings”, but which I actually regard as advantages. For example, the world renowned Brazilian Jiu-Jitsu black belt and grappling champion Jean-Jacques Machado was born without a fully formed left hand. However, it is quite likely that he is better than he ever would have been had his hand formed fully before birth and has almost certainly developed any number of techniques which work well for him in competition as a direct result of this. Likewise, rising MMA fighter Nick Newell was born with only the upper half of his left arm and yet today he is undefeated at 10-0 and has one of the best guillotine chokes in the business which he very likely developed because of the difference of his anatomy. Finally, the greatly respected wrestler, Brazilian Jiu-Jitsu practitioner and motivational speaker Kyle Maynard was born without either of his arms or legs, and yet he has been more successful in competition than most and continues to be an inspiration not only for grapplers and martial artists but people from all walks of life. In a recent online video Rener Gracie even had a public grappling session with Maynard and showed how he had developed a very unique technique for escaping bottom mount based entirely on his body type. As can be seen, many physical “limitations” are only such in so far as they are mental blocks. Particularly in the martial arts, and most importantly the gentle art of Jiu-Jitsu, physical shortcomings can be turned into advantages if the mind of the practitioner is focused on overcoming adversity. Because injuries will inevitably happen to a martial artist the best thing he can do is to figure out how to turn them into positives instead of viewing them as negatives. If you are a martial artist, next time you have an injury try to use it as an opportunity to improve some other aspect of your game and once the injury has healed you may find that it was a blessing in disguise and that you are in fact better than you ever were before. 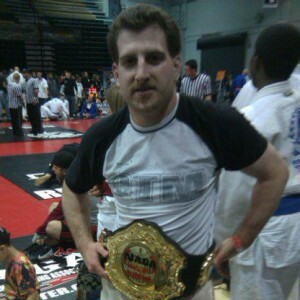 Jamey Bazes is a Poughkeepsie MMA practitioner holding a Brazilian Jiu-Jitsu brown belt with over 15 years of competition experience earning over 100 tournament victories. He also holds a Masters of Arts Degree in English from SUNY New Paltz with a focus on the English Romantic poets. MMA Tampa Coach and Brazilian Jiu-Jitsu black belt Matt Arroyo shows the secret to the Guillotine choke! 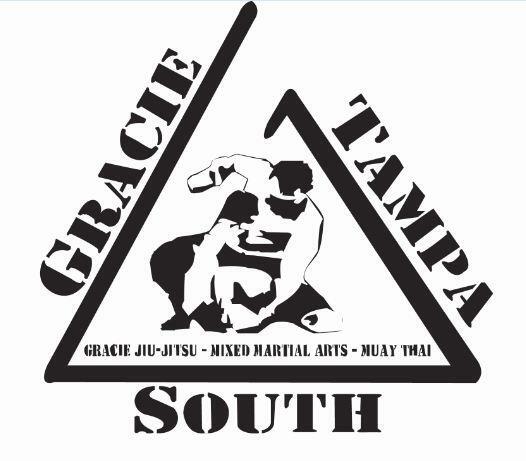 Gracie Tampa South MMA instructor Matt Arroyo unveils his lethal guillotine choke! With Chael Sonnen’s main event victory over Mauricio “Shogun” Rua at UFC on FS1 the entire MMA world was reminded how powerful the guillotine choke can be when properly applied. The guillotine is one of the most diverse techniques in all of Brazilian Jiu-jitsu. Arguably the most effective variation of the choke is the elbow high or “Marcelotine” version. This particular guillotine is made so effective by the arm positioning that simultaneously allows the attacker to apply an intense amount of throat crushing leverage as well as counter the most common defense. These factors make this submission nearly inescapable once it is locked in place. Here is a video of Ultimate Fighter Season 6 veteran Matt Arroyo. Matt honed his guillotine skills while working with MMA Tampa coach Rob Kahn (Royce Gracie’s first black belt) as well as Brazilian Jiu-Jitsu world champion Marcelo Garcia. Matt and his Tampa MMA students have used this technique en route to numerous victories in both sport grappling and professional mixed martial arts. Tampa Gracie top MMA Tampa source!